February 26, 2015 - Garmin today announced the GDL 84H and GDL 88H Automatic Dependent Surveillance-Broadcast (ADS-B) datalink. Helicopter owners and operators are offered added safety benefits with the GDL 84H and GDL 88H, which meet equipage requirements for ADS-B Out while receiving ADS-B In traffic and weather on a mobile device or compatible display in the cockpit. Industry leading ADS-B in technology provided by the GDL 84H and GDL 88H offer safety enhancing features specifically for helicopters such as TerminalTraffic, On Scene mode, TargetTrend and more. These products meet the unique and stringent demands encountered by helicopter operators, while providing them with a timely solution to meet airspace modernization initiatives. “We have leveraged our expertise in the helicopter industry to develop these optimized solutions that offer immediate benefits for helicopter operators today, while allowing them to meet the requirements of ADS-B Out by December 31, 2019,” said Carl Wolf, vice president of aviation sales and marketing. The GDL 84H and GDL 88H provide a rule-compliant ADS-B Out solution for helicopter operators in the U.S., while offering state-of-the-art traffic alerting capabilities tailored to these operators and their unique operations. Beneficial traffic and Flight Information Service-Broadcast (FIS-B) weather allow pilots to easily access the safety benefits offered by ADS-B on an installed compatible display or mobile device in the cockpit using Garmin Pilot. Enhancing the traffic display, TargetTrend relative motion technology helps pilots visualize the trend of the traffic threats as it relates to their aircraft, while innovative dual-link technology provides pilots with the most comprehensive ADS-B traffic picture available in the industry. On Scene mode minimizes nuisance traffic alerts when intentionally operating in close proximity to other helicopters during hovering operations such as Electronic News Gathering. This pilot-activated sophisticated technology acknowledges nearby traffic by reducing alerts while still providing alerts for new traffic threats. Pilot action is not required when resuming normal flight operations. On Scene mode is available with the GTN™ 650/750 touchscreen avionics and GDL 88H. As part of Garmin’s Terminal Safety Suite, TerminalTraffic provides pilots with the most comprehensive picture of ADS-B-equipped aircraft and ground vehicles in the airport environment. ADS-B-equipped aircraft in-flight are easily distinguished from ground vehicles and taxiing aircraft, which are displayed using distinct colors and symbols. All of this information is presented to the pilot on a simple, easy to understand SafeTaxi diagram with reference to runways, taxiways hangar locations and more. Additionally, when configured for helicopter operations, TerminalTraffic helps pilots easily distinguish potential traffic conflicts while in the airport environment by minimizing nuisance alerts from fixed-wing aircraft and abbreviating select alerts while performing unique helicopter maneuvers such as hovering. Flexibility and versatility provided by the GDL 84H and GDL 88H give operators a wide range of display choices to receive the safety and operational benefits offered by these products. The GDL 88H conveniently interfaces with the GTN touchscreen series or GNS WAAS navigators to display ADS-B traffic and weather in the cockpit. For operators without a compatible display, the GDL 84H wirelessly transmits weather and traffic information to a mobile device using Garmin Pilot when paired with the Flight Stream 110/210 Bluetooth® wireless gateway. Additionally, for helicopters that do not already have an approved WAAS position source on board, the GDL 84H and GDL 88H are optionally equipped with a built-in WAAS GPS receiver. These straightforward solutions give operators an easy path to meet airspace requirements, which provide innovative traffic alerting capabilities and give operators a variety of display configurations to receive the benefits of ADS-B traffic and weather. 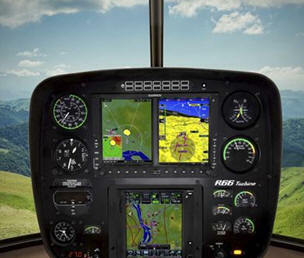 Garmin is expecting to receive Supplemental Type Certification (STC) for the installation of the GDL 84H and GDL 88H in several popular helicopter models in Q2 2015. The GDL 84H system with an internal WAAS receiver and Flight Stream 110 Bluetooth wireless gateway is expected to be available starting at $5,995. Additionally, the GDL 88H is expected to be available starting at $4,795.